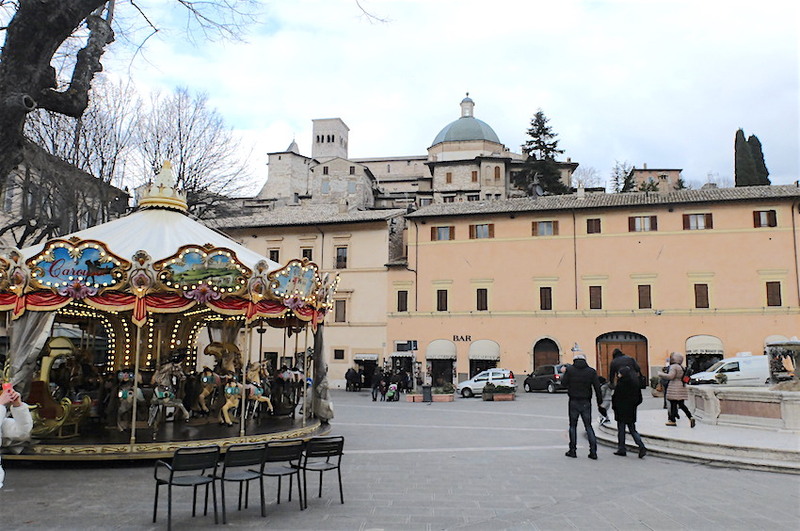 In a town with only one bar hopping with about five locals on a Saturday night, I couldn’t help but fall in love with this Umbrian town 90 miles north of Rome. Assisi, or best well-known as the birthplace of St. Francis and a bunch of saints, was well on this girl’s radar as part of my get-the-hell-out-of-Tuscany sometimes plan this year in a bid to discover more of our neighboring regions, and hell if Henry James was enamored with such a place, so could I.
Umbria is the ‘green heart’ of Italy, some would say more famous than Tuscany in an era of travelers looking for less-crowded but equally charming towns and here you have plenty of hilltop jewels to explore, Assisi, Norcia, Perugia, Orvieto, Gubbio, Spoleto. Another reason we were keen to go was to visit our friend Rebecca, who is owner of three self-catering apartments in town — whip-smart, dry humor with a heart of gold. 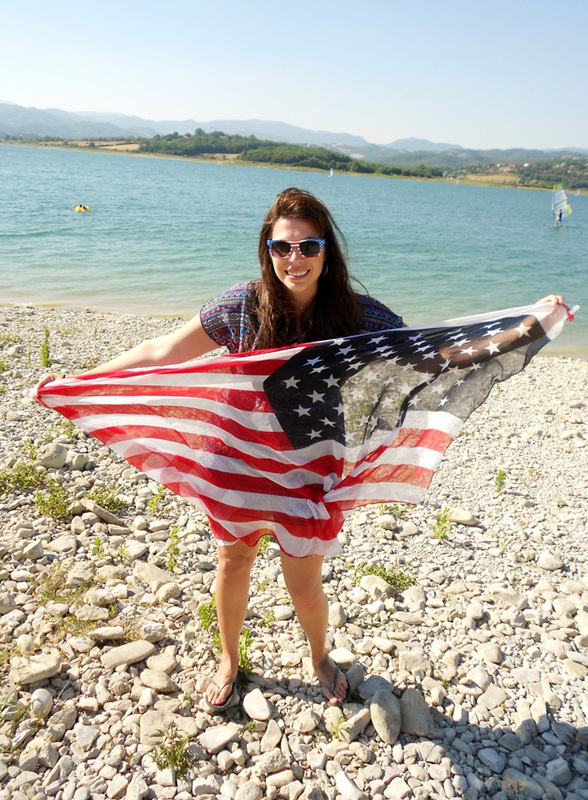 A long-term expat who is neither bitter over too many years in small-town Italy or a ‘drank the Koolaide’ optimist that sees no fault in her surroundings. Instead, she is pragmatic and normal, a single mom raising her kids in a town barely bigger than a whisper and navigating a huge Land-rover through streets that I’m pretty sure we’d be too frightening to take our Fiat 500, that’s badass material to me. The first night, we had dinner together, just the three of us, at a local spot that served up hearty pasta and local bubbles which blend well for long conversations. Hosteria Terra Chiama is on via San Rufino 16 is just off the main piazza del comune, on a small street snaking upwards. I thought about what life might be like in a small town where kids grow up hopefully less jaded than the ones I used to mentor in Los Angeles. At a certain point, one of her sons came to drop off the keys and kissed her on both cheeks, I couldn’t imagine a teenager in my hometown doing anything of the sort. It was a reunion of sorts, my friend Alexandra of ArtTrav and her husband Tommy were joining for a night, as well as the awesome Jessica of ItalyExplained who was traveling through the boot at the same time. 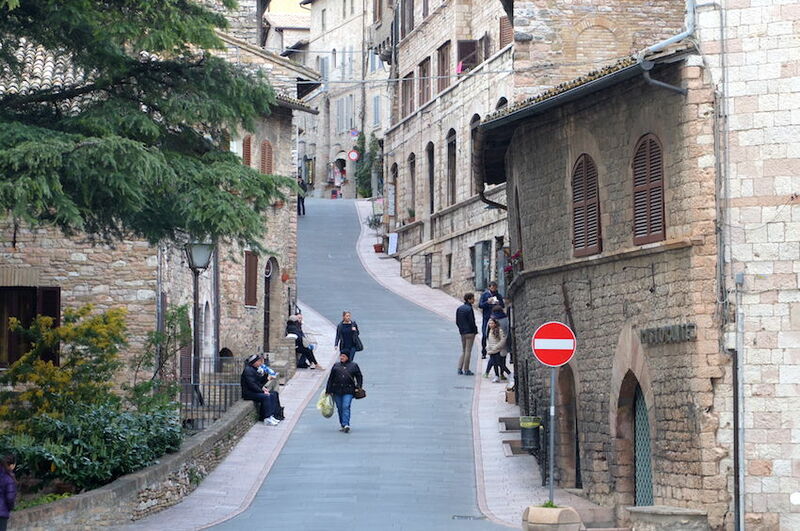 In Assisi, you’ll need your walking streets with all of these gut-busting hills! A lot of us bloggers talk about our love for slow travel or taking the time to really enjoy a place, without ticking it off some endless bucket less that is as soulless as my half-empty diet coke on my desk. 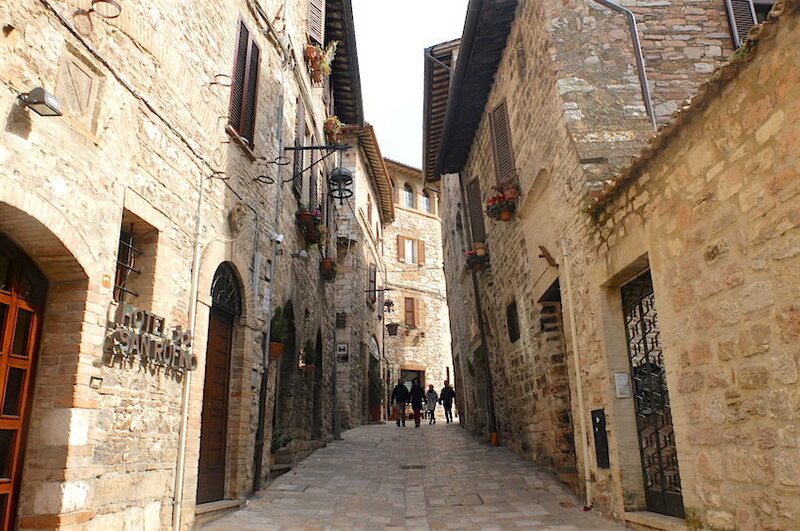 It’s true that you could visit Assisi in a day, or a few hours, but the real beauty comes with staying a little longer. 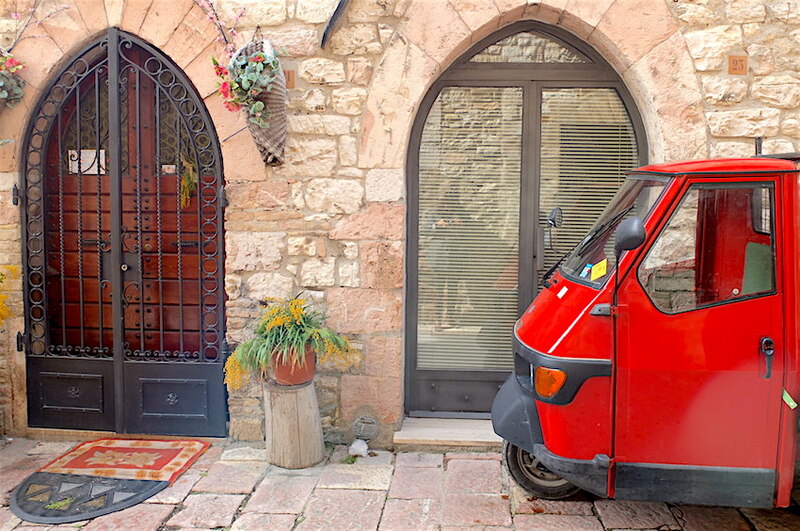 You never know what you might see if you stick around, for example, upon arrival, we dragged our suitcases down a tiny little alley towards Brigolante. I cracked a joke about the pilgrims that come to visit and sure enough two or three local kids came around the bend holding a humongous cross Passion of the Christ style. Likely off to take part of some procession in the next few days, or well I hope so because I can’t imagine what else that would be for. You can’t make these scenes up. 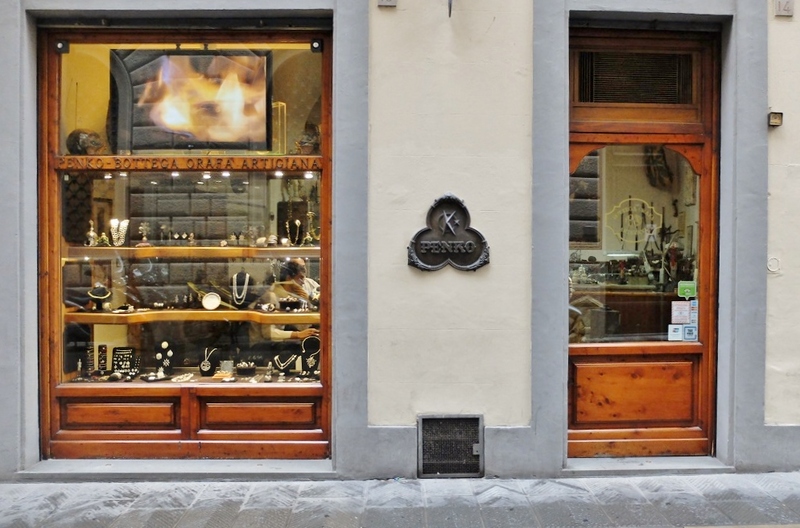 Staying longer meant that we could wake up late, hearing the morning buzz of piazza del comune while making our way to Bar Sensi on Corso Giuseppe Mazzini. 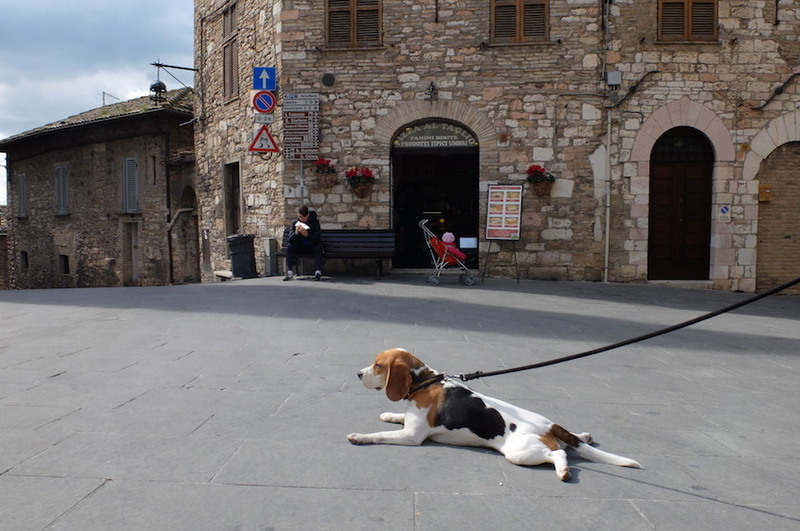 Take our dog Ginger on a long walk through the tiny streets, passing the beautiful Roman Temple of Minerva (Museo e Foro Romano), this dates back to 1st century BC and is considered the most intact Roman temple facade in Italy. With every corner awaited an even prettier scene before us. This particular weekend, the weather mingled between gray and dark, with spots of sunshine (spring), a soft wind prevailed and there were plenty of panoramas were gazing at from various scenic points in town. You can’t get all of that rushed in a day-trip, it comes with the ease of knowing you don’t need to see every damn attraction in the town before leaving at the appointment hour. Embrace a lazy pace, and your vacation will truly begin. Bring good shoes as the hills here are no joke, even for young people in their early thirties. The dog however, loved it. 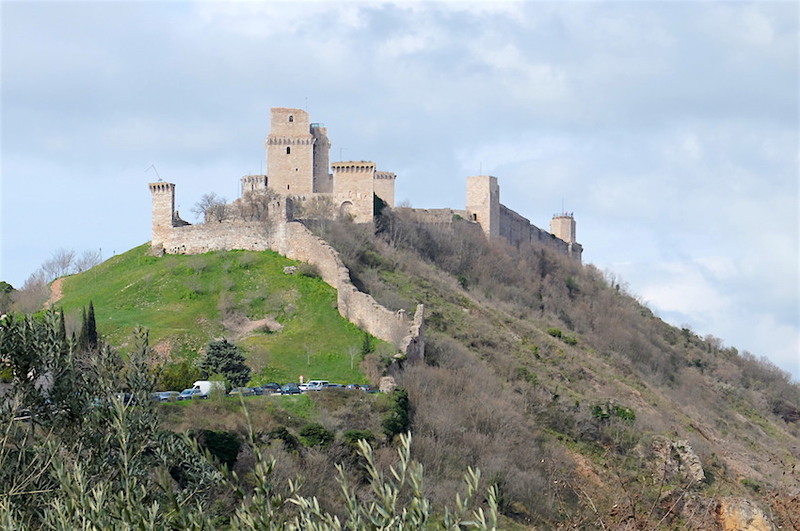 You could walk up to the 800 year-old Rocca Maggiore after lunch, an imposing visage from afar, Rebecca drove us one cold, windy morning. Meant to guard the town from naughty invaders, it was the principal fortress of the area and it is pretty easy to see why. 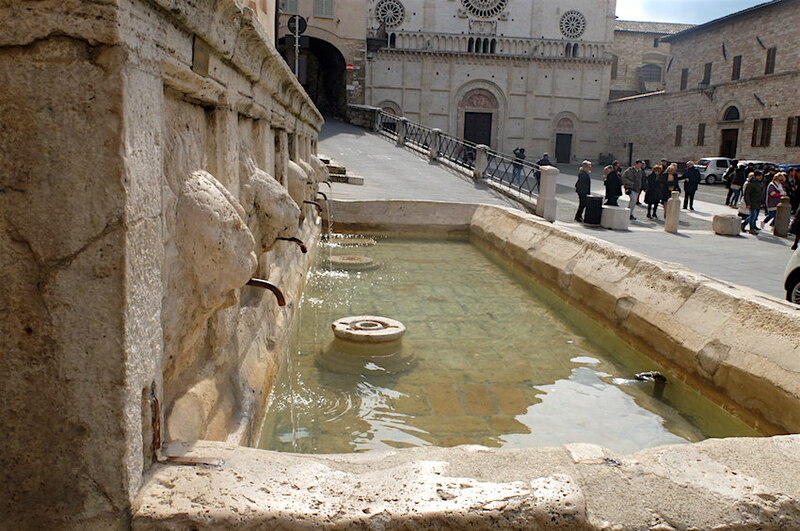 From here you get the best views of the Spoleto valley and of the Basilica of San Francesco. While as a first timer, a visit to the Basilica is a must, don’t think that is all you should see. The other churches are far less crowded and carry their own weight of charm. 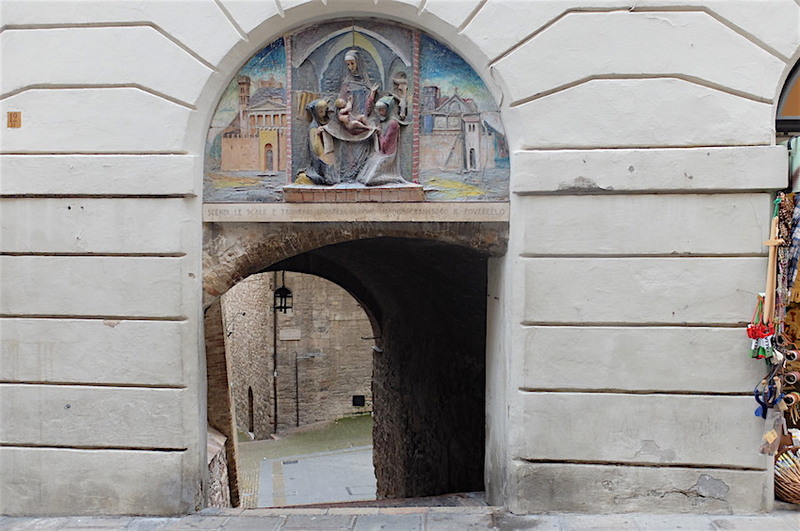 I’d dare say the highlight of being in Assisi to me was exploring the tiny streets, peeking into doorways and taking far too many photos. Via San Francesco and Il Corso are the main roads, filled with all sorts of crappy religious memorabilia and shops. I was hard pressed to find anything of value here, but I did spot a lot of cute Francis inspired leather sandal magnets that Nico refused to buy me. 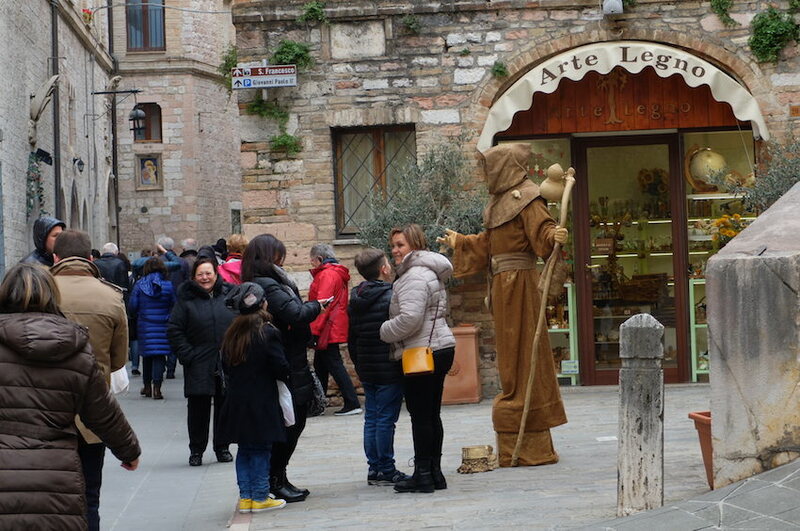 I admit that I am intrigued by the story of St. Francis, who strikes me as a bit of a ‘born again’, and he was, first born from a wealthy silk merchant in 1182, he lived the good life until become a prisoner of war in Perugia. Thus at the tender age of 19, he decided that god was his calling. Naturally his parents were pissed when he gave away all of his money to the church and took a vow of poverty. Instead of heroic medals and glory brought by the prized son, Francis abandoned even his costly threads for a coarse woolen tunic that was worn by the poorest of Umbrians, that I assure you looked pretty extremely uncomfortable and likely gave you a rash (its on display) to wear on any manner of a living being. He also founded the Franciscan order in 1208. 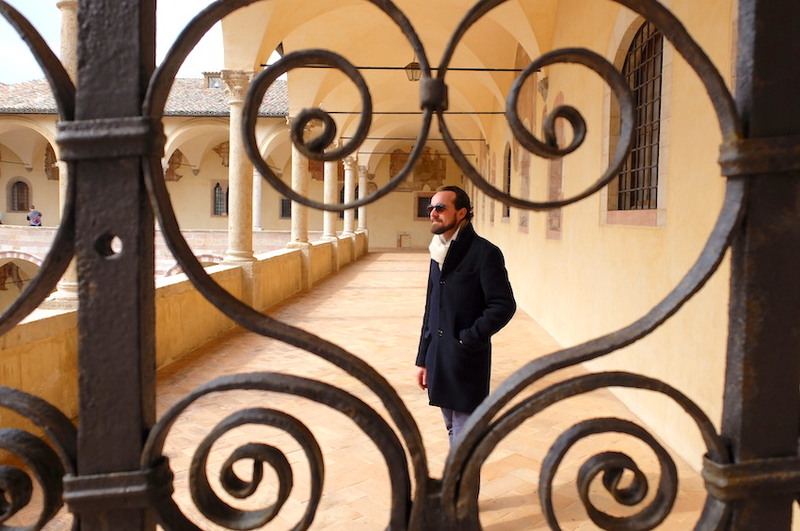 One of my favorite stories surrounding St. Francis is when he sold some of his father’s property to help save a local church in ruins, the ancient church at San Damiano. Naturally he incurred his fathers’ furious wrath. He first hid in a cave before coming out in rags and stinking to high heaven, he was laughed at by the townspeople so his father (sounds like a nice man) decided to lock him in a closet before his mom let him out for him to return to the church. He convinced rich people to give away their money and live a simple life. To top it all off and to channel ‘The Jungle Book’ he even converted a wild wolf to a town’s lovable pet, only saints can do that, right? The Basilica is the celestial golden child of the town and also UNESCO heritage site that attracts millions (yes!) of people and pilgrims annually, while the population hangs around 3,000. Don’t be freaked out by the armed guards, it was a little bizarre to me to have a automatic rifle so close to my face before visiting one of the holiest places in the middle of nowhere, but ok, this is 2016. Since it tends to get crowded when the day-trips tours get there, go as early (or as late) as possible to check out the frescoes by Giotto documenting the life of Saint Francis in relative peace, of course the basilica is vast and impressive. Not a religious person myself, I still enjoyed myself and an audioguide or real guide, is recommended. The concept of Francis surrounded by all of his friends in the lower crypts. 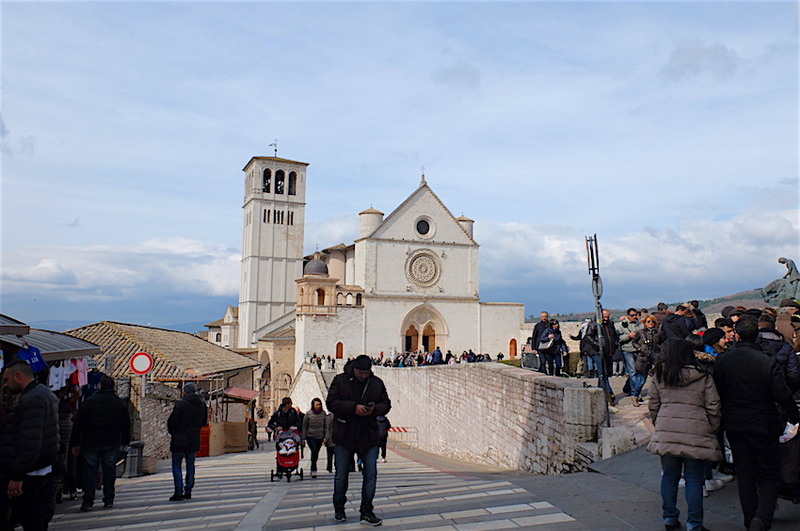 My friend Rebecca also recommends getting a coffee at the Caffe San Francesco when you’ve had enough of Assisi’s most famous attraction. One detour worthy of writing about happens to be at Lake Trasimeno, a beautiful spot an hour away from Assisi, located in the province of Perugia. 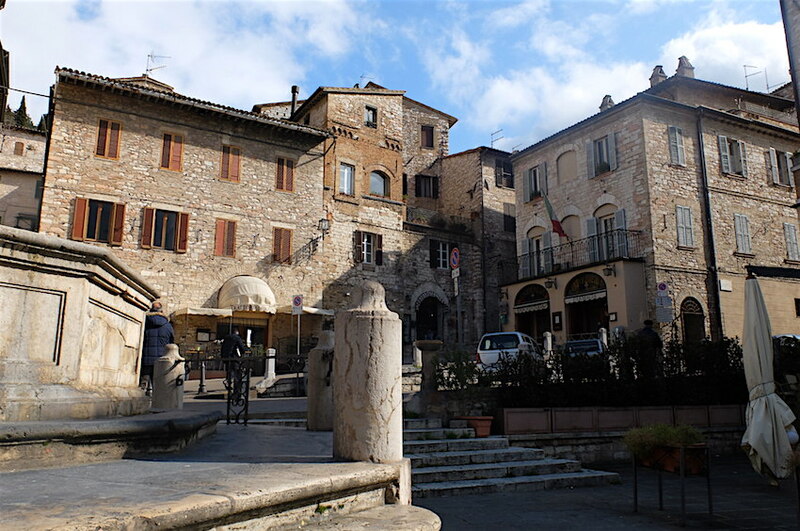 We spent some time here last year, and I loved the charming little town of Castiglione del Lago. On our way back to Florence we stopped at a little restaurant lakeside, Osteria Rosso di Sera with a cool contemporary feel serving up new-age fish and chips and their tasty tegamaccio, a local fish stew very reminiscent of cacciucco in Livorno and complete with the local lake ‘eel’, don’t be squeamish, it tastes great! 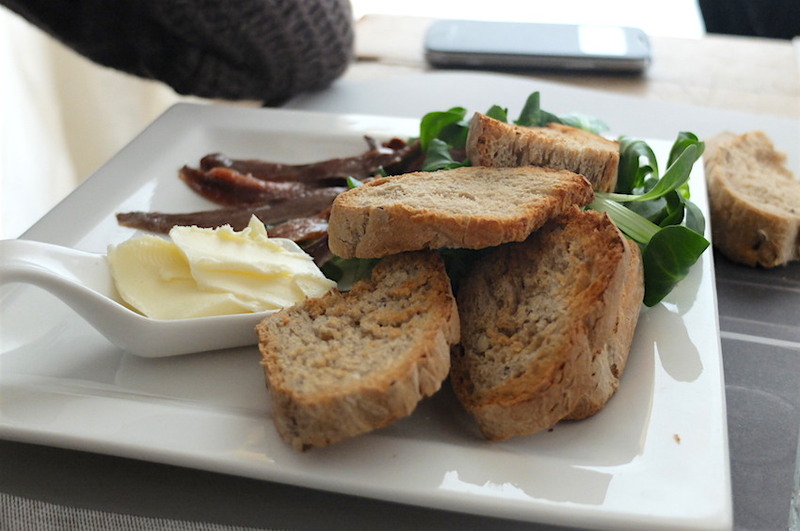 butter, bread and anchovies, simply the best (and most simple) dish on earth. 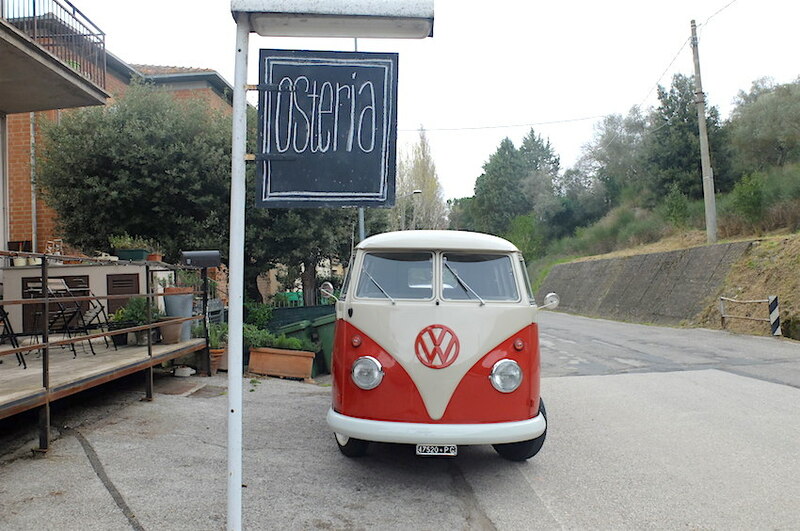 This charming VW certainly knows how to get the osteria attention! 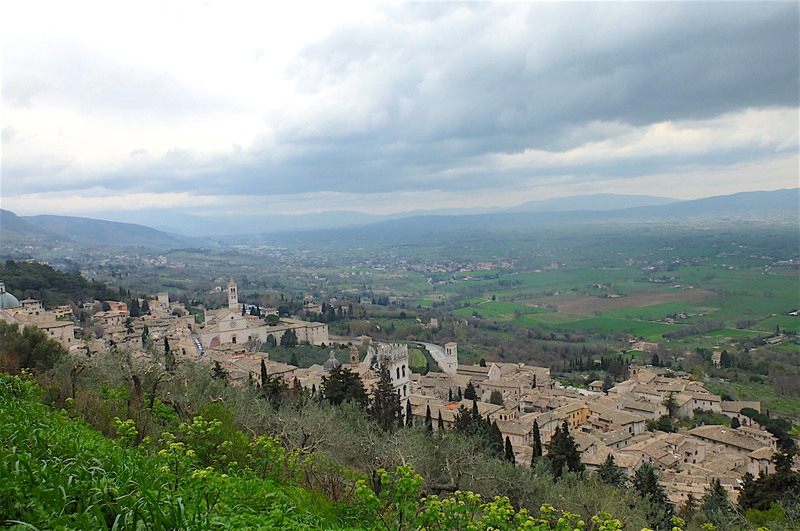 Assisi is about 20 kilometers east of Perugia and a 2 1/2 hour drive from Florence. By train you can hop on a regionale veloce from Santa Maria Novella to Assisi in about 2 1/2 hours, a one-way tickets costs 15,65 €. 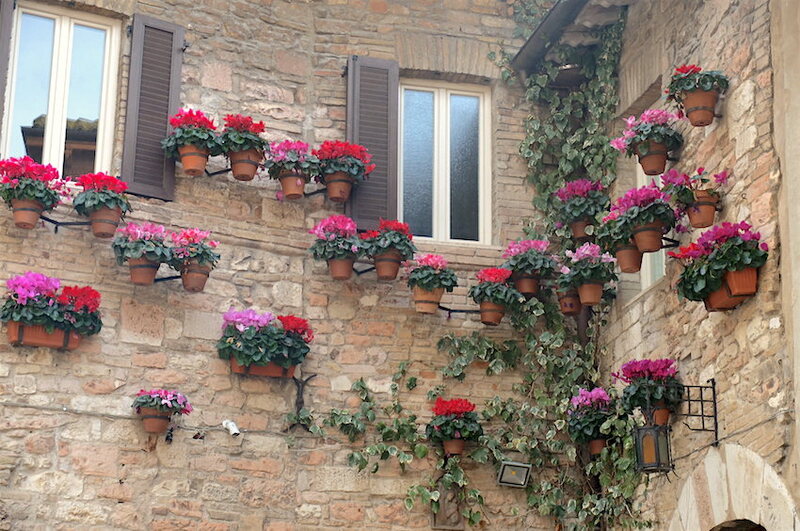 I’d dare say spring (late April or Early May) is a great time to come for the colorful green countryside in full bloom and to check out the annual Calendimaggio festival. I would fare say summer is quite hot here and more crowded than you’d like, with fall being yet another great time to visit with the abundance of harvest seasonal festivals. Basilica di San Francisco, naturally the most popular local attraction for visitors and pilgrims alike. 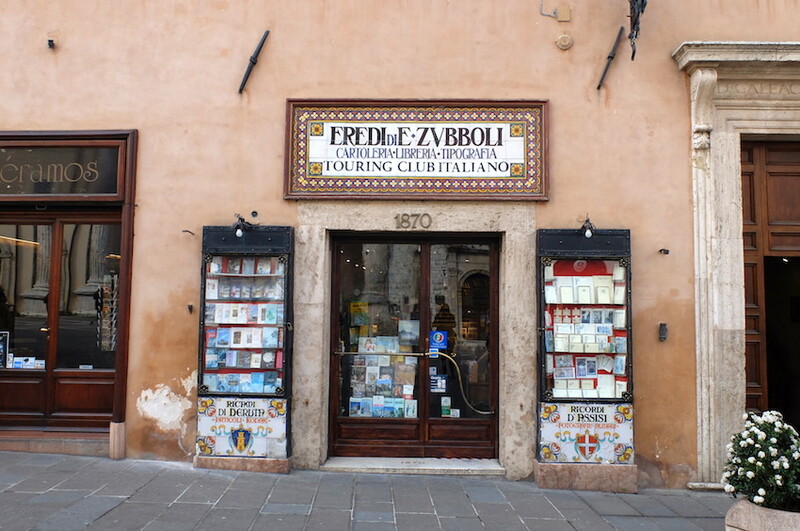 Address: Piazza di San Francesco. Opening hours: The upper church is open from 8.30am-6.45pm, lower church & tomb 6am-6.45pm. Basilica di Santa Chiara, the final resting place of Saint Clare, which was St. Francis’s bestie. This early gothic church with a pink and white stone basilica lies next to a gorgeous terrace overlooking the valley. Worth seeing is the ‘Oratorio del Crocifisso’ housing a 12th century crucifix and frescoes by Puccio Capanna and Pace di Bartolo along with the Neo-Gothic crypt containing the tomb of St. Clare. 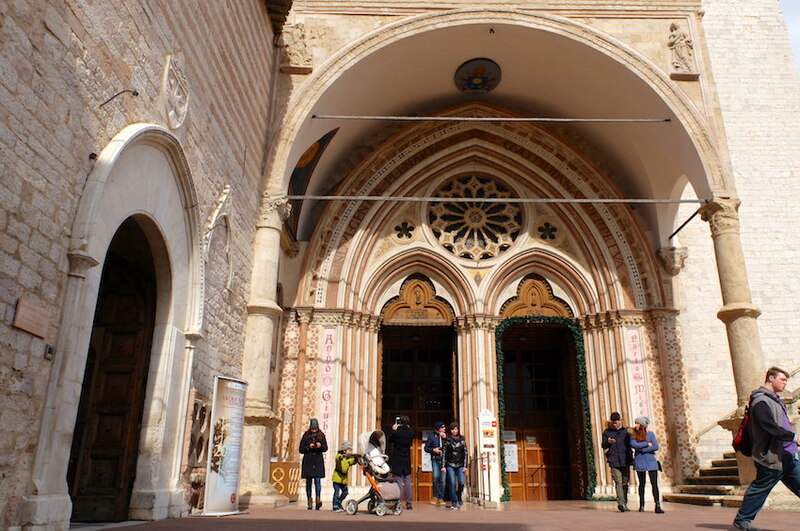 address: Piazza Santa Chiara, Assisi, Italy. Open 7am-noon, 2pm-sunset. Duomo di San Rufino. 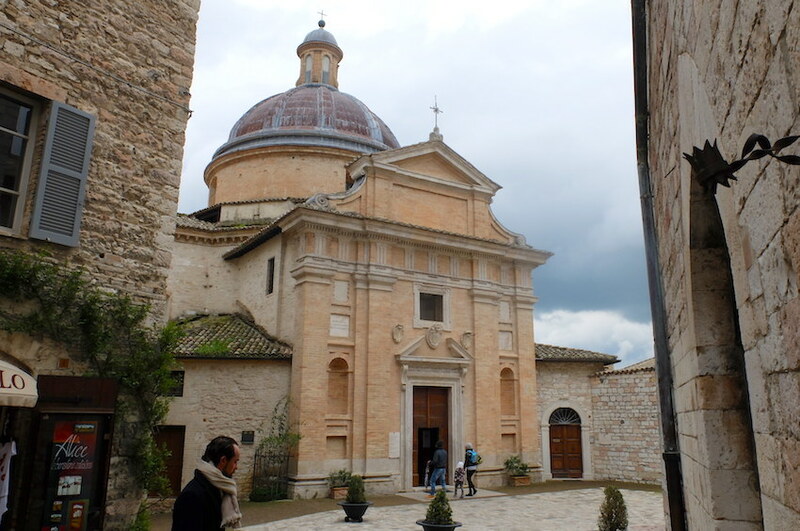 Assisi Cathedral, the 12th century church has a Romanesque facade and is said to be built (maybe) on an ex Roman forum. Rather plain inside, the outside has interesting detail worth studying. 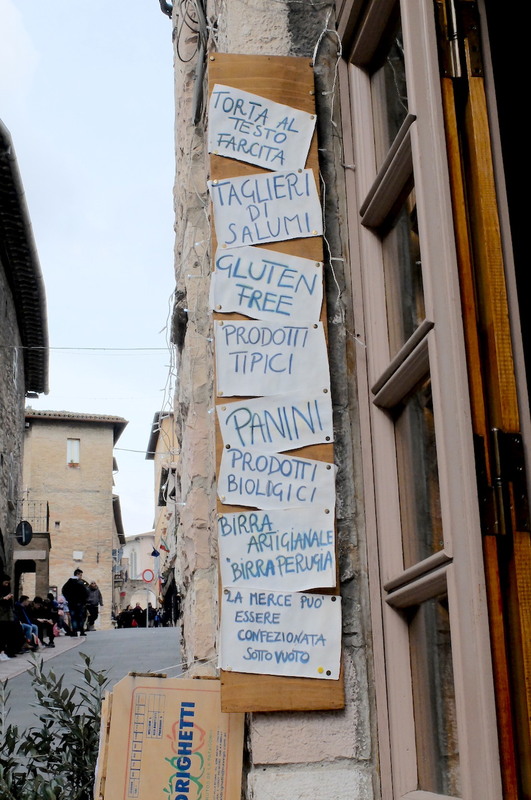 address: Piazza San Rufino, Assisi, Italy. Rocca Maggiore, Piazzale delle Libertà Comunali. 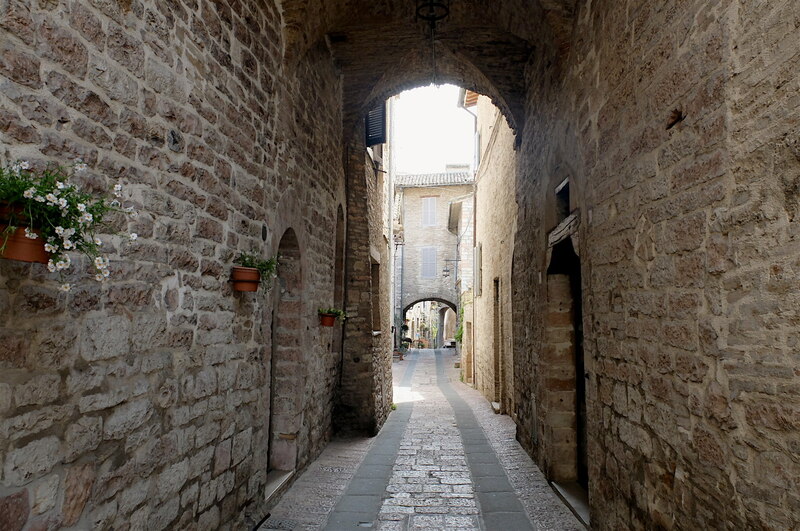 Look for the signs clearly marking the path to the Rocca from outside the town’s walls. Trattoria La Pallotta, a lovely little family restaurant in the historical center. Address: Via della Volta Pinta, 3. Phone: 075/812649. 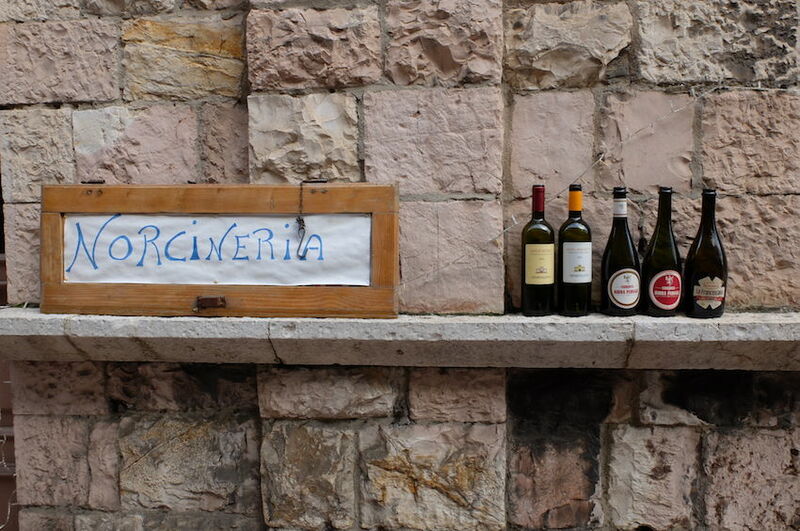 For local wine, try the local variety, Grecchetto! Hysteria Terra Chiama, where we ate our first night, its located close to Piazza san rufino in a charming little local featuring local seasonal dishes and excellent wines. Around 25-35€ per person. 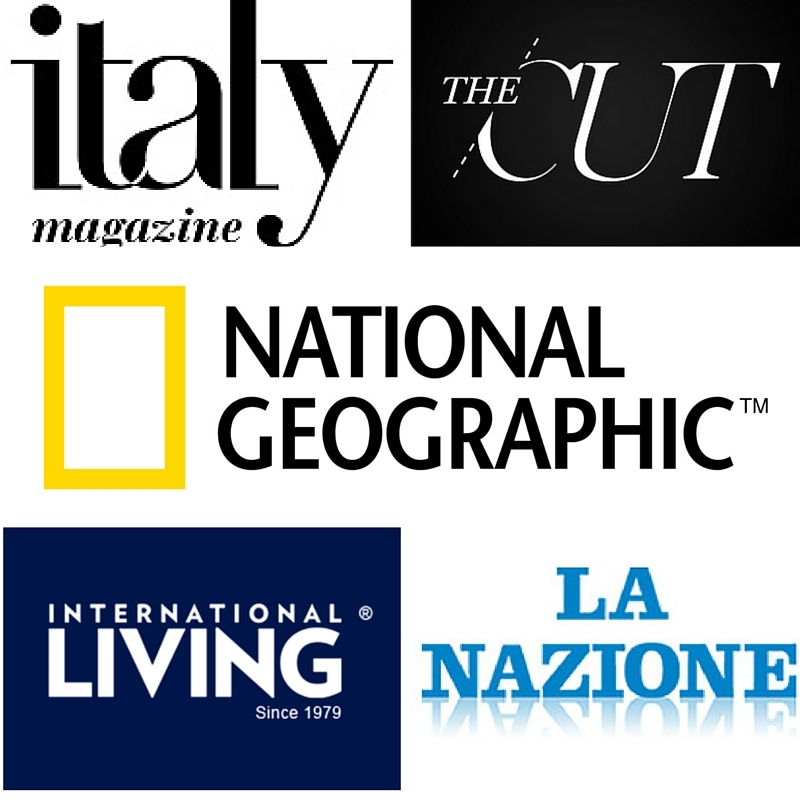 address: via San Rufino 16. Bar Sensi, Vicolo degli Esposti, 1, 06081 Assisi PG, Great spot for breakfast, gorge on their homemade pastries and don’t be scared to ask for a bear in your cappuccino foam ;-). 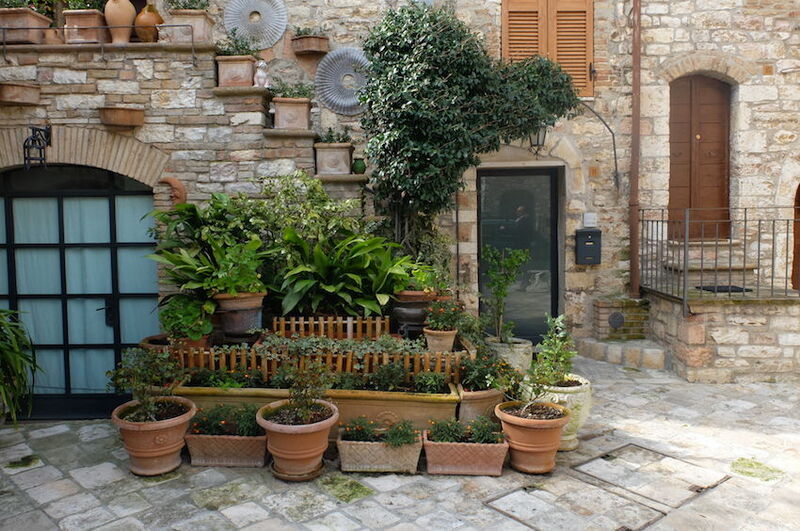 Outside of Assisi on Lake Trasimeno, Osteria Rosso di Sera, address: Via F.lli Papini, 81, San Feliciano PG. 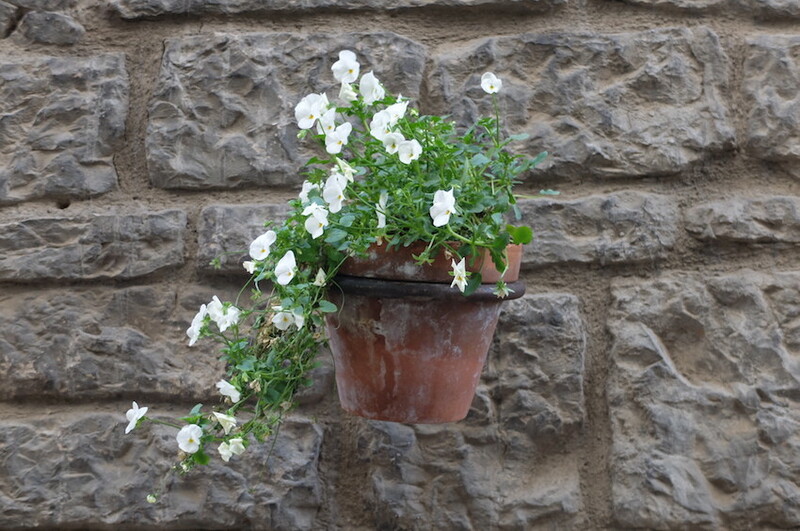 Calendimaggio (“Calendi” means day and “maggio” means may) – is a festival to celebrate the arrival of spring, three days of the locals dressed in medieval costumes held in May, and the largest of the town. It happens the first Thursday, Friday and Saturday after May 1. Read more about it here. 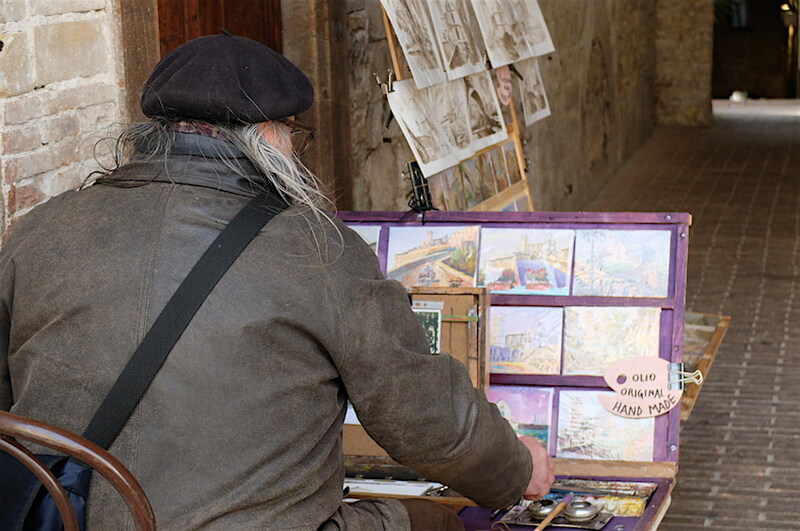 International Antiques Fair or the Mostra mercato nazionale dell’Antiquariato, one of the largest antique fairs in Italy, it’s happening right now until May first. Palio of Saint Refines – Palio di San Rufino, happens on the Thursday, Friday and Saturday of the last week in August. 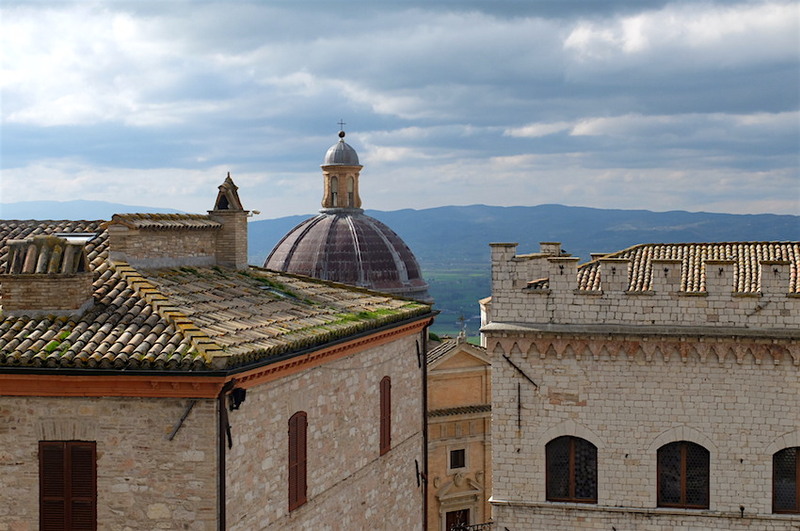 With the townspeople divided in three districts, the Assisi palio competes using bow and arrows. 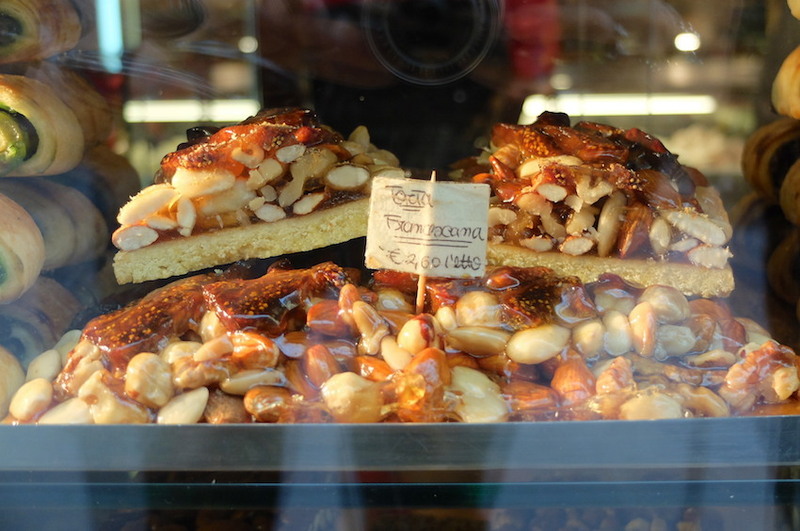 Brigolante Blog by Rebecca, an invaluable resource to discovering the local area. 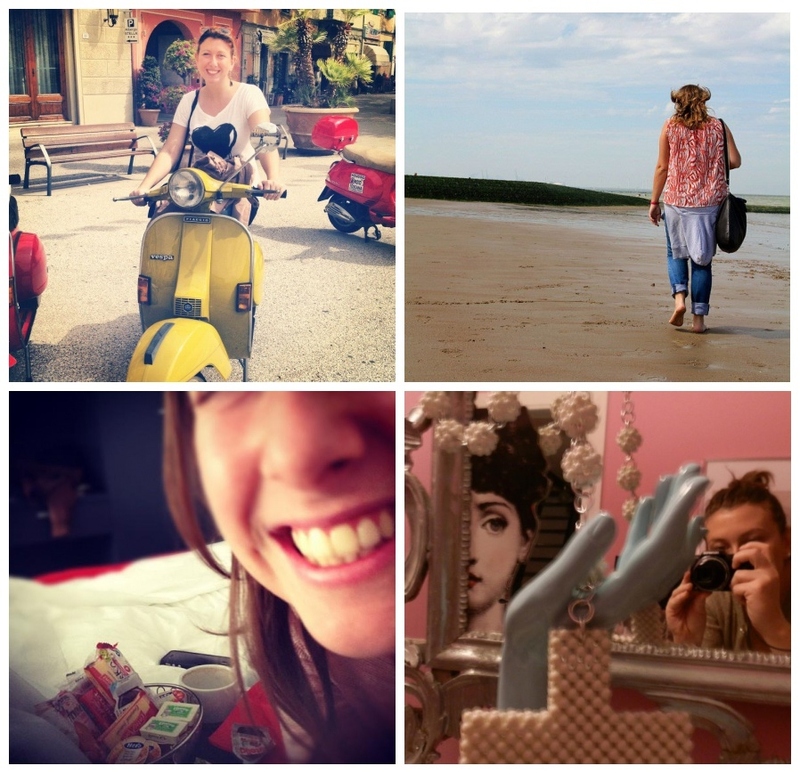 Check out her personal itineraries. Stay Where The Action Is by Wandering Italy. What’s it like being with an American? Lovely post. 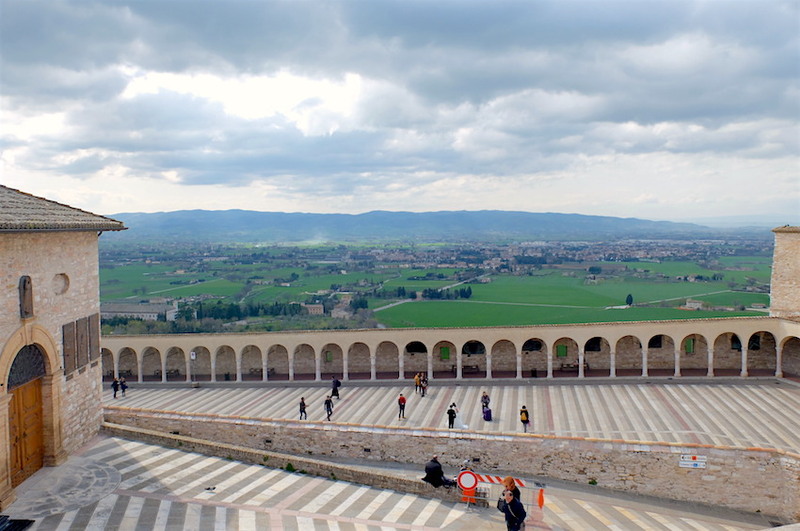 I visited Assisi almost 40 years ago. Your post brought back so many memories! Thank you Anna! This was one of the first times in 2016 that I really felt relaxed after getting back to the daily grind at work, plus Rebecca’s hospitality made everything so easy. I can’t wait for the next chance to get out there. Georgette, of all your great blog/posts (which I adore) this one is outstanding! The posted photos are stunning and I pinned most of them so others can drool along with me. Thank you, a bright spot in my otherwise aggravating morning. 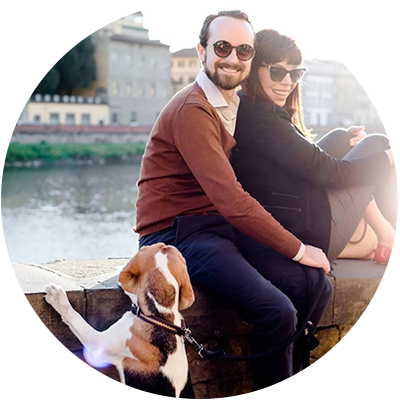 Myself and a friend will be in Florence (again) for the month of September (we have an apartment in San Nicolo) and after bumming around Italy south of Florence til November or longer if we are inclined. We hope to meet and treat you to a drink (or two) when we are there. Meanwhile I will be enjoying your posts and adding wonderful places, things and food that you mention to “the list” of that we might not know about. Hello Ina! Thank you so much for your kind words, you kind of made my day with your comment and I appreciate it. 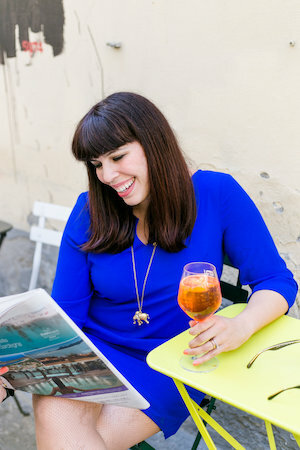 If I’m around, I will absolutely meet up for a drink, September is a great month to visit Florence and I’ll make sure to do extra research regarding events for that month with you guys in mind. I wonder what “Torta di testo farcito” is. Is that testo like text, or testa like head… stuffed head or stuffed text, both sound interesting. Note, when arriving by train, a bus or taxi is needed from the station to the center of town. The walk is 2+ miles (almost 4 km) – a bit far for most. Buon viaggio!